Some people living in a condominium complex near the Summerlin Parkway and Tenaya Way say they have no where else to turn after suspected gun-toting squatters took over two units and making life a living hell. 13 Action News first reported the issue in June when some neighbors complained the squatters were causing problems. "I hear the gun shots when I am sleeping for work," Blake Watson told 13 Action News in June. "It's 1 o'clock, 2 o'clock in the morning and I wake up at five and 'bop bop bop' it sounds like it's right outside my window," explained Watson. Neighbors report the issues continued throughout the summer and so did the potential danger. "Sooner or later, one of these bullets they they are having their gun fights with it going to hit somebody in these units," said Hal, who did not want to use his last name. 13 Action News attempted to contact members of the HOA board multiple times, including the property management company but inquiries were not returned. 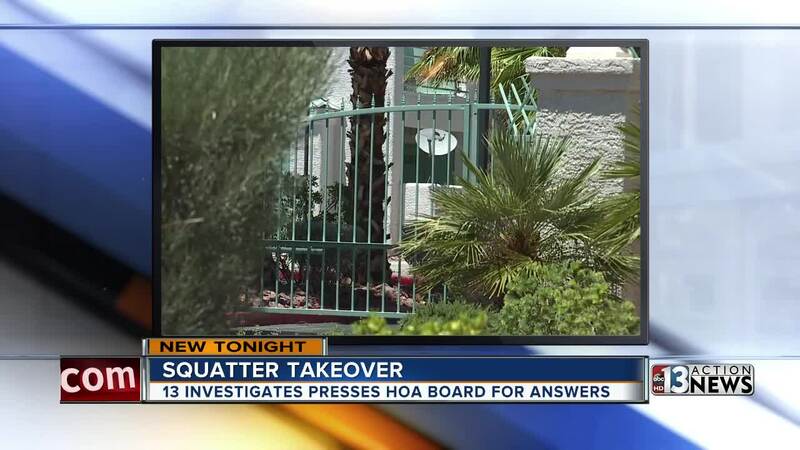 13 Action News decided to crash a recent HOA board meeting to confront the president about the squatting issue. Reporter: Tom, we have been trying to get a hold of you. I am Joe Bartels from channel 13. I'm going to give you my business card and I've left you several messages. Tom Keefe: I have no comment. Reporter: So you have received my messages? Tom Keefe: Yes. I have no comment. Tom Keefe: I have no comment. For you guys. We will talk to the owners at our meeting. Reporter: Gotcha, so you are going to bring it up and speak to them about the squatting situation? Insiders present at the meeting say the HOA launched an investigation into the squatting issue after 13 Action News pressed the board for answers. Some residents report within days of the 13 Action News confrontation, Las Vegas Police stomed the units in question and booted the squatters. Residents are now hoping their nice, quiet, and peaceful condominium complex stays that way.